← The end of books? Adapting books for the screen is tricky, even with big bucks and star power there is no guarantee of getting it right. Time and time again, audiences excited to see their favourite story brought to life have left the cinema disappointed, cursing the director for failing to match what their minds had conjured up. Once upon a time, I would have said, without hesitation, that the combination of Tim Burton and Lewis Carroll’s Alice in Wonderland was a match made in adaptation heaven. In Edward Scissorhands, Beetlejuice, The Nightmare before Christmas, James and the Giant Peach, The Corpse Bride and Big Fish, Burton spun magical, edgy worlds where you were never quite sure what would happen next, ideal for the irreverent Victorian fantasy. But Charlie and the Chocolate Factory left a nasty taste in my mouth, which overpowered my appetite for Roald Dahl and the delicious Johnny Depp. So, I reserved my expectations. And Burton proved me wrong yet again – his latest attempt to adapt a children’s classic is a triumph, remaining true to the spirit of the source material while offering something new. We first encounter an Alice much like the one in the books, at seven, complete with blue pinafore dress and buckets of curiosity – and suffering a constant dream about a strange land of wonder. Twelve years on, Alice (Mia Wasikowska) is still curious, which puts her at odds with her peers and the starched white environment full of rules she is forced to inhabit. Alice’s mother and sister hope she will marry a chinless aristocrat whose family now owns her recently deceased father’s company. Before she has to make a decision, she falls down a rabbit hole into Underland, a place she remembers from her dreams. Or does she? As Alice surrenders to the oddly familiar world she finds, dream or not, she is expected to attempt a heroic feat, the success of which will decide the Underlanders’ fate. Burton has fashioned a plot out of the book’s series of mad, vaguely connected events, one that well sustains audience interest in the 108-minute running time, without losing the essential whimsy. Absurdity is ever-present, provoking helpless giggles, and blended with plenty of heart that will ensure you care about what happens. The plot-driven narrative suits Alice’s journey from uncertain girl to empowered heroine, transformations the Australian Wasikowska deftly manages, whether physical or mental. Her Alice is strong without being spunky – she is realistic despite her surreal surroundings. There’s an unsettling hint of romance between Alice and Depp’s Mad Hatter, but overall the two have winning camaraderie, and you understand their support for one another without need for exposition. Depp, forever a Burton muse, disappears into the makeup-heavy role, projecting pathos as the post-traumatic-stress-disorder-suffering Hatter. His English accent has come on in leaps and bounds since Sleepy Hollow, however his Scottish one needs more work – the instances in which the Hatter lapses into an angry Braveheart are only the false notes in an otherwise faultless performance. Wasikowska and Depp take care not to overshadow the galaxy of supporting stars, most of whom are digitally manipulated or animated, mixing seamlessly with each other and the fantastical environment. Helena Bonham Carter (Burton’s wife) as the toddler-like and decapitation-demanding Red Queen, is both villain and comic relief – and somehow sympathetic. The White Queen, the Red Queen’s rival and sister, allows the oft-sweetly neurotic Anne Hathaway to try something new – she is ethereal and a touch psychotic, like most of the Underlanders. Crispin Glover’s Knave of Hearts is enjoyably deplorable, while the Cheshire Cat (Stephen Fry) and the Caterpillar (Alan Rickman) are languidly voiced. The White Rabbit (Michael Sheen) is suitably antsy and the March Hare (Paul Whitehouse) is completely bonkers. The often hangdog Timothy Spall works well as the voice of Bayard, a kindly canine who has to balance helping the Underlanders’ cause and looking out for his family. Little Britain’s Matt Lucas is especially entertaining as bantering twins Tweedle Dum and Tweedle Dee – or “fat boys” as the Red Queen amusingly refers to them. Underland is gorgeously rendered, a shadowy rainbow place that sharply contrasts with the prim and proper Victorian world above. Within Underland are rich environs that reflect characters, such as the Red Queen’s psychedelic palace, the Hatter’s decrepit Tea Party and the White Queen’s austere castle, adding to the texture and expansiveness of the imaginary world. The 3D is not integral, but there were moments when I tried to dodge “flying” objects. The CGI is a tad video-gamey at times, especially at the Red Queen’s palace, where Carter’s digitally oversized head bobs along unconvincingly against a painfully color-schemed backdrop. At other times, it’s eerily tangible, as when Alice steps on corpse faces in the moat surrounding the same palace. 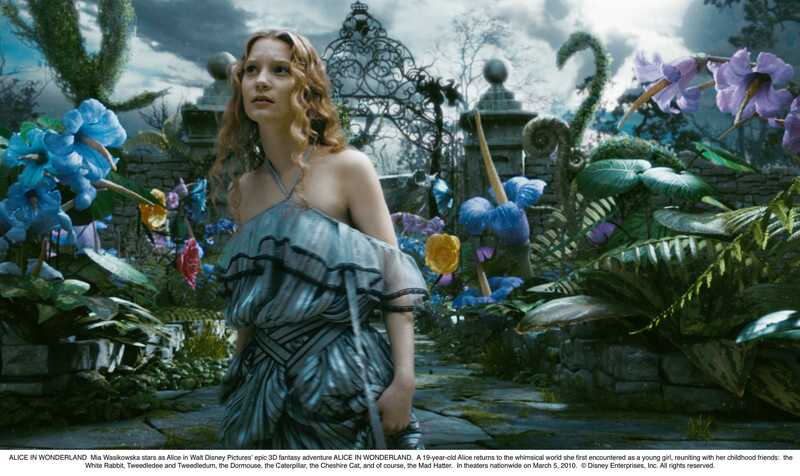 More consistently impressive than the CGI is the makeup and costuming, particularly with Alice’s outfits as she shrinks and expands, and enters new places, nonchalantly donning couture outfits that fashionistas would give their eyeteeth for, and add to her development and the wonder of Underland. Perhaps the best thing about the film is that it achieves closure – a rarity in this sequel-driven age. Burton may take two hours to tell Alice’s story, but he wraps it up, and treats the audience to many ingredients while he’s at it – a coming of age, an epic battle, hilarity, thrills and enough visual eye-candy to land you in a sugar coma. It satisfies while leaving you wanting more. Future novel-to-film adaptors would do well to take a page out of Burton’s book – he’s created something existing fans will likely love, balancing admirably between faithfulness and originality. Verdict: Maintains the magic of the book while offering surprises, adding up to a weird and wonderful ride you’ll want to return to. I would really like to see this! Again, I should have gone in Oz. mmmmm Johnny Depp…. He’s not that hunky in this! Actually, I wouldn’t say he’s hunky in any Tim Burton movie… you need What’s Eating Gilbert Grape, Don Juan de Marco and Chocolat for proper visual feasting.